Gather your periodic pals and molecular monsters for some ...ahem..."research", in the Atomic Arena! 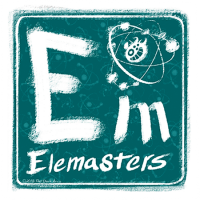 Can you master the elements and become, an ELEMASTER?! One game set allows two players to compete with countless variations of character decks with rules based on the actual periodic table that make it both fun and educational. No, really...this isn't 'one of those'. This game is FUN and scales in skill level from as simple as Uno, to something a little more strategic. It also caters to the time you have available ranging from as low as 3 minutes to over 60 minutes. I know, right? This game was originally inspired by my son's young passion for the periodic table, math, creatures, science and of course, our mutual love of games. After years playtesting this game off and on with friends and family, it's finally ready to share. I hope you find it to be as educational as it is elemagical! Add a Review for "Elemasters"
2 boxes to hold it all!